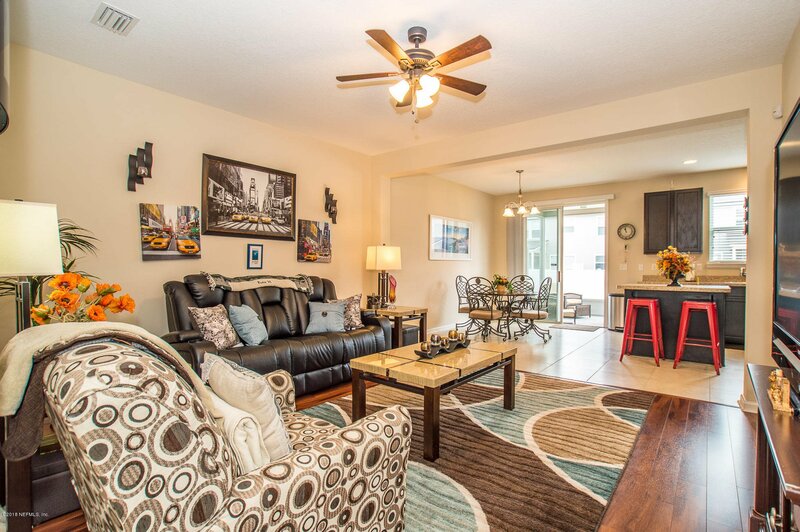 This Stunning 3 bedroom, 2.5 Bathroom Mattamy Built Townhome located in the heart of Oakleaf in desirable Community of Willowbrook at Oakleaf Plantation shows like a Model. I guarantee you will be impressed the moment you walk through the front door! Home has beautiful laminate flooring in the living room, staircase, and tile flooring in the wet areas and laundry room. The beautiful wall mounted electric fireplace will convey with home. 42'' Espresso Kitchen Cabinets have newly installed hardware (installed after pictures taken), Master Bathroom has large shower and double vanity. Enjoy your morning coffee inside your screened lanai. Located in walking distance to Great High School, Junior High and Elementary Schools. Plus access to all Oakleaf Amenities! Schedule your showing today! Listing courtesy of WATSON REALTY CORP. Selling Office: BERKSHIRE HATHAWAY HOMESERVICES FLORIDA NETWORK REALTY.